Reading Perfumes: The Guide 20181 has got me revisiting old samples, among them Lubin Upper Ten and Upper Ten for Her, both of which received four stars. Turin writes that Upper Ten has “the cleverest accord I have smelled in a very long time,” and Upper Ten for Her is a “perfume doing the splits.” How could I resist? Upper Ten was developed by perfumer Thomas Fontaine. Its notes include Italian bergamot, bay rose, saffron, juniper berry, cinnamon, essence of cardamom, peach, orange blossom, geranium, cedar, sandalwood, leather, patchouli, white musk and dry amber. The accord Turin references is juniper, pepper, and aldehydes, and it smells like January in an unheated artist’s studio with canvases drying on the easels. It’s icy and faintly medicinal and sharp with piney paint thinner. Three minutes in, the bracing accord warms and melts into a more conventional blend of wood, leather and vetiver. The whole experience is like being shaved with a frozen straight-edge razor while sitting on a metallic stool, then led to an old leather club chair near the fire with a velvet throw draped across its back. Upper Ten’s pleasant, opaque body lasts at least half a day but doesn’t quite make it to dinner time. If you’re in the market for a traditional woody masculine-leaning fragrance for the cooler months, Upper Ten is worth sampling. 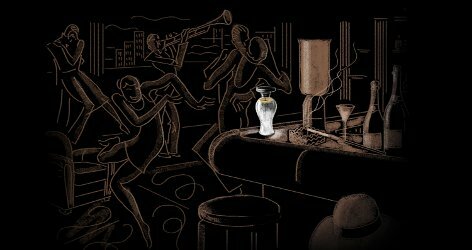 Upper Ten for Her was developed by perfumer Delphine Thierry. Its notes include Isabella grape, bergamot, elemi, artemesia, Bulgarian rose, marigold, raspberry liqueur, Sichuan pepper, precious wood, amber, frankincense and dark chocolate. At first, Upper Ten for Her’s insistent raspberry and chocolate turned me off. But, the more I wore it, the more I liked it. The perfume’s blend of sweet and sharp wood reminds me this is a fragrance, not patisserie, and as Upper Ten for Her dries down, incense wafts through it. Upper Ten for Her lasts all day and keeps up a hearty sillage. I love a woody fragrance with a hint of fruit in autumn. If DelRae Bois de Paradis didn’t head that list for me right now, Upper Ten for Her would be a contender. 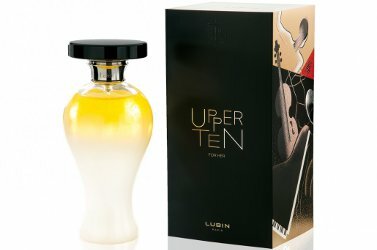 Lubin Upper Ten Eau de Parfum is $200 for 100 ml, and and Upper Ten for Her Eau de Parfum is $170 for 100 ml. For information on where to buy them, see Lubin under Perfume Houses. 1. Perfumes: The Guide 2018 is Luca Turin and Tania Sanchez’s compilation of perfume reviews from the past decade, since Perfumes: The Guide A – Z was released in 2008. Happy to hear your take on these! I recently acquired a sample of UT for Her and was surprised by how much I like it since I don’t really care for sweets or gourmands. I like the 1st half better than the second since I get all the woods, incense, and that tart grape in the forefront while the chocolate raspberry truffle buzzes underneath. Agree that you are reminded it’s a fragrance and not a dessert, mostly. Love the flapper’s mom, and hers sounds like my kind of night ???? I admit I wouldn’t mind a satin chaise longue and a box of truffles, either! Thank you! Anthropomorphism is one of my sharpest skills. Thanks for reviewing these, Angela! Re Upper Ten, I love this series of Lubin bottles that are inspired by abstract idol statues (as seen for Idole de Lubin, Akkad, Korrigan and Galaad). They all smell pretty good, but I haven’t loved any of them enough to snag one of those bottles yet. I like the color variation for Upper Ten and will be sure to give it a try the next time I’m at Arielle Shoshana. I admit that I only gave them cursory attention the first time I smelled them. (I mean, there’s so much out there! It’s hard to give anything more than cursory attention!) They’re worth a bit of extra time for sniffing though, I think. I love your description of the flapper’s mom. Funny how in some ways she wouldn’t be too different from some people nowadays. I acquired a used bottle of UTfH in a swap, and while I think it’s “good,” there’s the same problem with so much niche today, which is that there’s nothing about it that comes across as exceptional, and at that price, that’s the only way I’d consider buying a bottle. In fact, I’d probably do a blind swap for it, if I thought I’d be getting something that’s a bit more interesting. And I can say that about most of the niche bottles I own. If they can sell bottles, though, good for them. As to the fragrance aficionado, if there was nobody else buying, I think they’d be better off just selling 2 ml samples, because that’s all I’d “need” of these kinds of scents. Thank you for weighing in on this! It really is hard to find something that smells new and interesting when you already have a solid fragrance collection. I buy maybe two bottles of perfume a year these days, if that.